Samsung’s newest phone is setting another first with a rear camera that slides out and flips around to become a selfie cam, a neat trick that makes for a front that is entirely screen. The phone in question is the A80, the latest from Samsung’s rapidly expanding mid-range Galaxy A series. But if we can even call this “mid-range” is up for debate, as the Galaxy A80 seems to have quite a few features one could fairly call premium. The front is a smooth slab of black glass and the design lets you seamlessly slide the two rear camera lenses up from the back to become a front-facing camera for selfies. This system is ingenious, and quite mesmerising when you watch it happen the first time. 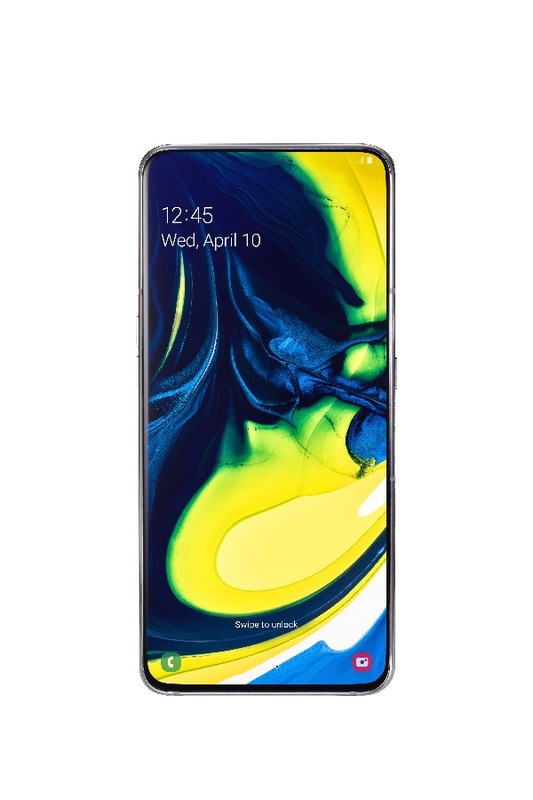 And while something similar was seen once before on a phone from budget manufacturer Oppo, the Galaxy A80 is the first Samsung to feature a rotating camera. The new top of Samsung’s mid-range phones, the A80, features a rotating rear camera that flips out and doubles as a selfie cam, giving room for a front that is almost entirely display. While pundits have been sceptical of moving parts and their inherent risk of breaking, a growing number of smartphone manufacturers are using sliding and rotating cameras to save space for more display. So how much screen does Samsung’s first rotating camera system leave you with? The A80 has a 6.7-inch full HD Super AMOLED display with hardly any bezels, and no notches or holes for camera lenses getting in the way of Samsung’s “New Infinity Display”. The camera itself is made up of a main 48 MP shooter, as well as an ultra-wide 8 MP lens, which should come in handy when flipped around for group selfies. Most smartphones are fitted with a lower-quality lens for selfies, but the A80 lets you use the same sensors for front or rear-facing photos, which means higher-quality selfies. The camera array also features a 3D depth sensor, which measures the distances from the camera to create a better sense of depth in portrait photos. The A80 uses a Snapdragon 730 Octa Core processor that runs Android Pie. The battery is smaller than in other Samsung phones at 3,700 mAh, but it compensates this with a super-fast charging feature. Following the current trend, the new Galaxy has also ditched the headphone jack. The new device has 8GB of RAM and 128 GB of storage, and according to SamMobile it will cost around US$730 in Europe, although Samsung has not yet revealed any pricing. The colours available are black, gold and a white with hints of pink. The A80 now forms the top of Samsung’s A mid-range, which packs varying degrees features into eight phones (A10-A80), all aimed at buyers who don’t want to pay upwards of 750 dollars for a top-end Samsung phone from the S10 range. Top of the mid-range? 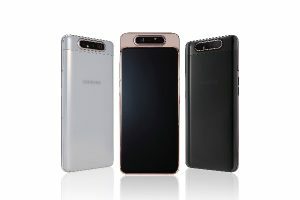 Samsung unveils A80 phone with rotating camera 0 out of 5 based on 0 ratings. 0 user reviews.